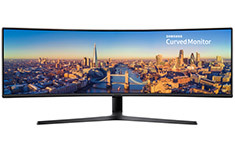 With a feature set as impressive as its 49in super ultra-wide curved screen, Samsung’s CJ89 monitor is designed to promote performance in any workplace. So whatever your task, you can enjoy working smart with Samsung. Full features include a 1800R curved display, 3840x1080 resolution, 5ms GTG response time, 144Hz refresh rate, DisplayPort 1.2, HDMI, speakers, height adjust, tilt, swivel and VESA 100mm support. With a screen area equivalent to two 27in monitors side by side, the 32:9 aspect ratio 49in display lets you view and manage multiple projects and windows with ease.